Vallée’s 4DA10D forklift represents the evolution of mobile underground mining equipment. 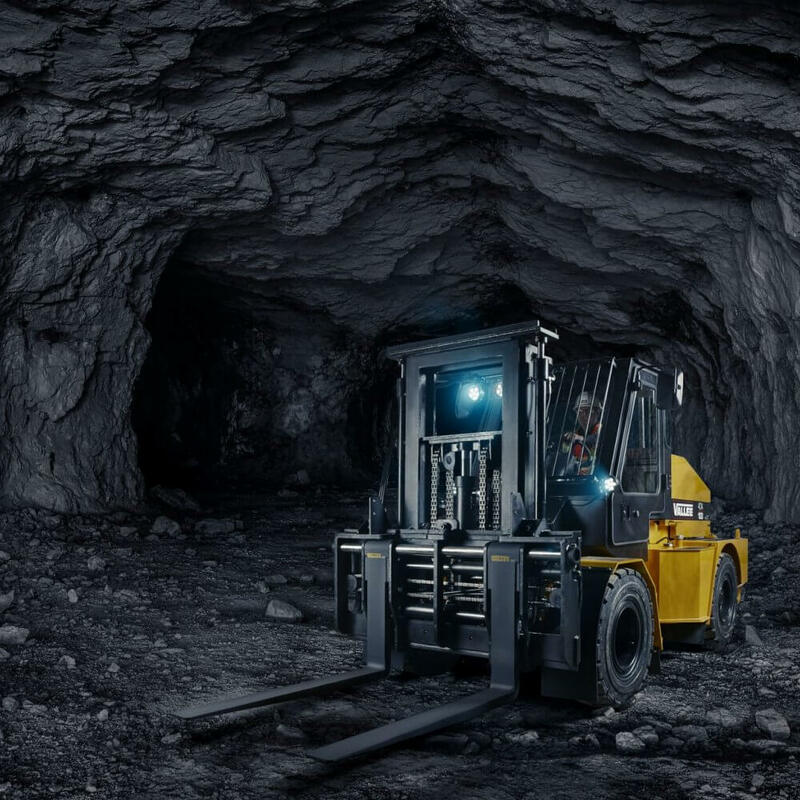 Made tough to withstand the rigours of underground mining, and compact designed to snake and weave its way around tight confined spaces, it is the smallest mining forklift on the market able to load, haul, transport and relocate up to 10,000 lb. of materials or equipment. 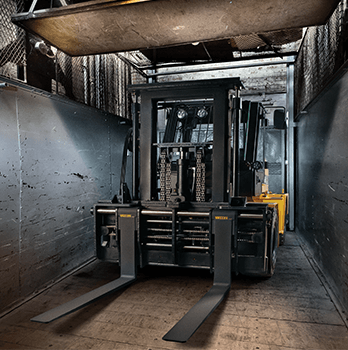 In the Vallée tradition of designing and manufacturing heavy-hitters that pack a lifting capacity belying their compact size, the 4DA10D can haul up to 10,000 lb. – the only mining forklift this size on the market capable of handling such a load. 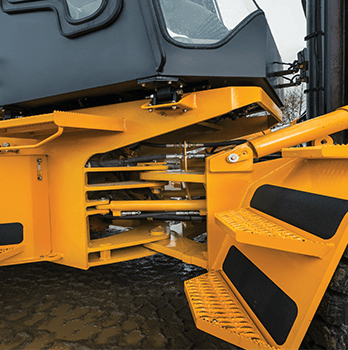 Because deep mining is all about working in tight spaces, the articulated 4DA10D has a turning radius so small it lets you operate in restricted environments, and is designed so compact it can easily squeeze into mine shaft cages. Built tough and to work long hours, the 4DA10D is also ultra operator and condition responsive, thanks to features like leveling and side shifting that allow it to handle and move steadily and with precision even in the roughest uneven underground terrain. Following an injury to a worker, a mining company called on Vallée’s engineers and designers to create and produce an arm that could safely pick up and move 7,000-volt shovel power cables without any ground personnel. In less than six weeks, we designed and built the Mine Cable Manipulator, which later won a prize for innovation from a leading workers compensation board. 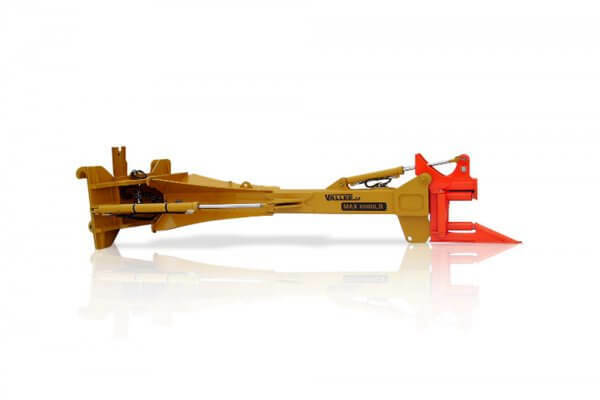 A mine cable manipulator is a cable hoisting and moving mechanism you can operate from a loader or lift truck. The rugged hydraulic arm is equipped with a cable holder fitted with rollers to minimize cable wear and tear caused by frequent handling. 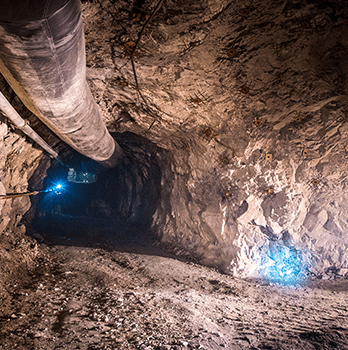 We engineered the Vallée Mine Cable Manipulator specifically for the harsh working conditions typical of surface mining.